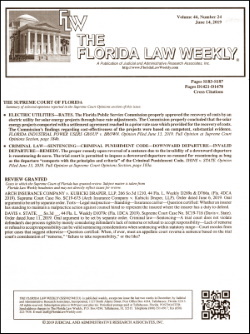 For complete, 24/7 access to all cases published in Florida Law Weekly. Your personal password to FLW Online is as little as $10.50/month if your office maintains a subscription to Florida Law Weekly. All cases filed by Florida's appellate courts (the District Courts of Appeal and the Florida Supreme Court). Available on the day of filing. Our brief but comprehensive headnotes that help you quickly decide if the case is relevant. Our fast search tool that lets you find the newest cases or any published case back to 1995. Extensive subject-matter indexes allowing you to quickly find subjects and cases of interest to you, complete with links to the decisions. Add to your shelved library our timely reporting of court decisions. The Florida Law Weekly in print reports the full text of cases from the Supreme Court of Florida and Florida's five district courts of appeal within days of filing--months ahead of the official reporter's advance sheet.